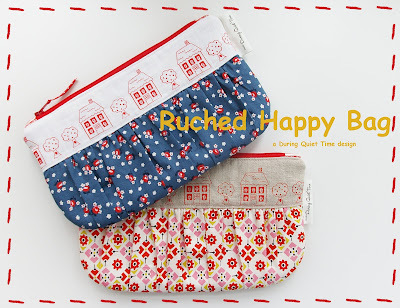 I received a lot of positive feedback on the little ruched/gathered bag that I made a couple of weeks ago so I decided to write my first official pattern! It is now available in my Etsy shop. I designed this pattern to highlight just a small piece of “My Happy Place,” my hand printed screen print of little houses and apple trees. So often we have special pieces of material that we hate to cut into yet want to see everyday. This bag is the perfect way to highlight that special fabric and you only need to use a tiny piece! The “Ruched Happy Bag” is a fully lined, zippered bag featuring a focal band with a ruched bottom and softly rounded corners below. It measures approximately 6” (15.2cm) high x 9” long(22.9cm). Did you see how I included metric measurements there? That’s thanks to one of my terrific pattern testers who lives in the UK. She kindly reminded me that not everyone uses inches and yards so I have included metric measurements and printing instructions to make sure that those in Europe are able to print their patterns to scale. You may sell bags made with this pattern provided you include a tag line and are sewing them yourself, not commercially mass producing them. I hope that you enjoy making this little bag as much as I do! I’d love to see your pictures of completed projects added to my During Quiet Time Flickr Group. I will make sure to comment on each and every one!